Cost: 473 USD for parts package (550 USD assembled). Another review of an item coming all the way from the Far East; Hong Kong in this instance. So it's good to report that the kit arrived very well packed and in good condition. I know many of you remain a little cautious of buying hi-fi from web sites, more-so those in the far East, so I will write a little bit about DIY HiFi Supply which I hope will reassure anybody considering purchasing from them. DIY HiFi Supply is based in Hong Kong, and is the creation of Canadian, Brian Cherry (a life-long hi-fi nut in his own words). Brian is married to a native of Hong Kong and their choice of home is based on the climate! 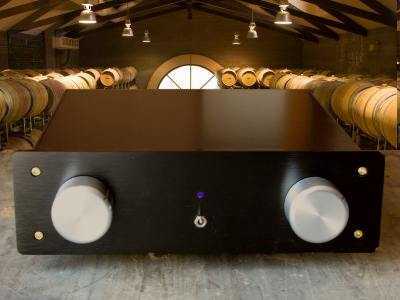 The company has been trading for quite a time now, and TNT-Audio reviewed their Django pre amp back in 2006. There is currently a staff of seven, and they supply approximately 70% parts and modules, and 30% complete kits. They've become quite an established, and reliable, source of kits and components, some of which are hard to source elsewhere. Typically, design of their products is done in the USA, Canada, UK, or in-house, and the manufacturing and part-sourcing is done in China (although components for their own designs come from the USA, UK and China). 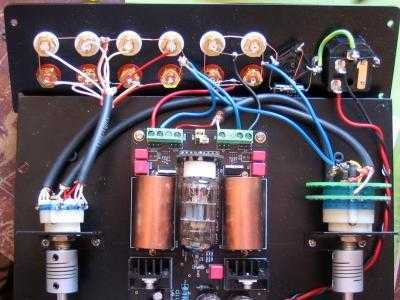 Brian Cherry provided this potted history of DIY HiFi Supply. We started with 3 kits that were discontinued retail products from the Opera (Consonance) company in China but we offered upgraded parts and circuit topologies. Very soon with the help of Thorsten Loesch, we developed our own unique circuits and parts recipes. The most successful of these was an updated WE91 300B monoblock amp. We now source our parts from suppliers in many countries. Heavy chassis parts come from the 'technology belt' in southern China where many exotic and specialist parts and materials have become available in the last few years, allowing us to have custom made some very unique products. To stay ahead of the plethora of China tube companies we use unique and advanced circuit topologies from leading designers. With the parcel opened, I removed the case that contained all the other parts inside it. Having opened the case, I laid everything out to check that it was all there, and get a basic understanding of what was what, and what went where. Of course, there is an over-whelming urge to heat up the iron and dive in (even amongst reviewers) but it is sensible to download the instructions (comprehensive PDF files in the case of the EZ Linestage) , make a drink, and spend some time going over the assembly procedure first. There isn't actually a great deal to do in the assembly of the EZ Linestage. It is more a question of wiring the (already) completed PCB to the transformer, volume control, input selector, and the various sockets. There are quite a few of them in this kit as it has three sets of inputs, and two outputs. In fact I would like to compliment DIY HiFi Supply for the inclusion of two sets of output sockets. For anybody running a bi-amped system (or satellite speakers with subwoofers), this makes it much easier to hook everything up. The wiring itself isn't too complicated but a couple of things made it slightly harder than possibly it needs to be. The first problem is the case. Nothing wrong with it as a case, it's aluminium, very sturdy aluminium and looks quite nice in satin black with its chunky over-sized front panel, and classy solid aluminium knobs. But it is made from an extrusion that fits over the chassis, and has the front and rear panels screwed to the extrusion. This means that you cannot secure the rear panel in place while you solder to the sockets. So you have to lie the panel on its side. In one way this makes it easier to reach the sockets, but the panel is always 'floating' until the whole case is assembled, something you don't want to do until after it is all completed and tested! It also means that the cables going from the line stage to the rear panel are longer than they would be if the rear panel was attached to the chassis at the outset. When you 'fold' the rear panel into position, the wires (there are quite a few of them) are then compressed into the tight space between the PCB and rear panel. In practice, I didn't have any major problem with this but it is worth mentioning. The other slightly tricky part of the build is the soldering of the wires to the attenuator. Because the two wafers (left and right channel) are so close together, it is very difficult to get the soldering iron tip onto the tab to solder the wire for the left channel. A spacer would keep the wafers further apart and make this part of the job much easier. Apart from the above, the job of building the EZ Linestage was straight forward and didn't present any other problems. Once the wiring is completed there are no adjustments to make (unless you want to adjust the gain using the jumpers provided), you simply connect it up, check the output for any DC, and then connect it into your system. However, on testing, I had a mains hum. After trying a couple of alternative wiring solutions from DIY HiFi Supply without success, I decided to try earthing various parts of the pre amp to the chassis (using a wire with a crocodile clip at either end). The hum went when I made better connections between the chassis, and the brackets that hold the attenuator and selector switch. I assume that where these have been coated, the electrical connection is a little compromised. With the hum cured, and a check of the DC offset on the output, I was ready to audition the unit. I have spoken to the supplier about the issues mentioned above and am informed that they now supply a thinner coaxial cable for wiring to the sockets (so there is no worry about compressing the cables when the rear panel is in place), and that the issue that I had with the brackets will be checked and rectified in future. The attenuators are more difficult to sort out without a re-tooling job but I am also informed that none of their customers so far have complained about this issue. DIY HiFi Supply also asked me to mention that there will also be an option to have a standard pot in place of the attenuator which will obviously bring the price of the kit down a bit. With the EZ Linestage hooked up between a Monica3 DAC (fed from a modified Logitech SB3), and a dual mono Gainclone, the first test was to turn the volume level right up to maximum with no music playing, and listen for any noise. On the last three positions of the attenuator, I heard a small amount of hiss with my ear right against the speaker drivers. However, when playing music, I never got near turning the attenuator that high. In other words, you can consider the EZ very quiet in operation! Having left the EZL to burn in for a few days, I then started my audition. Speakers were IPL A2 kit speakers. The EZL is not quite as transparent as having no volume control and input selection (nothing is) but it only took a track or two before I stopped noticing the difference between the EZL and a simple valve buffer without the controls. As pre amps go, the EZL is more than 'satisfactorily' transparent. DIY HiFi Supply tell me that it could be improved but at such a cost, that they have decided to keep the EZL 'affordable', and leave such tweaking to the customer. It has an open airy sound but not one that lacks drive or weight. Bass is well controlled, deep, and tuneful. There is a large sound stage stretching from wall to wall, and the imaging is crisp, with space around the different elements. As you would expect from a valve pre amp, there is a gorgeous, slightly warm, mid-range that gives vocals a delightful reality. The top end is clean and not over-bright. It plays all sorts of music well, and it would be misleading to say that it favoured one genre over another. The EZL worked perfectly with the dual channel Gainclone, and also with the Virtue Audio2 although I am still not convinced that the latter benefits as much from a valve pre amp/buffer as the Gainclones do. It also worked very well with the Charlize Class-T amplifier. What I can say is that with any of these power amps driven by the EZL, it was a compelling performance and one that I just wanted to sit down and listen to for ages. In fact the EZL is so enjoyable to listen to, I soon forget those few niggles in putting it together! The EZ linestage sounds very good, clearly uses very good quality components (I love those Obligato capacitors), has a very solid feel to it, looks fine, and generally gives the impression that it is a classy piece of hi-fi. Price-wise, well this older reviewer can't help making comparisons with the hi-fi market of say 20 years ago. A valve pre amp of this quality would have then cost many times more, so even allowing for the fact you have to put in a few hours soldering, it is a bargain in my opinion. Of course there is much more competition today but I would still rate the EZL good value for money in the current market. If you are looking for a high-quality valve pre amp kit that includes a good quality case and all the sockets, I would strongly suggest that you consider the EZL. It doesn't have an RIAA input for turntables but DIY HiFi Supply can supply a separate product, the UTS, for those of you who need that facility. Great picture! Thanks for the thorough coverage and I've taken note of the 'niggles' to make the EZ Linestage even better. I want to draw attention to the centre-piece of the EZL: the UTS (Universal Line Stage) module. It was designed as an EZ add-on output stage for a CD/DVD, allowing the removal of the most serious limitation in modern players: the opamps. The trick is to accomplish this without using a cathode follower or buffer, which has its own liabilities. The UTS output is taken from the anode; much of its good sound is attributable to allowing the anode to play its natural role. Coincidentally, the 0.5v>2V gain needed by a CD player outputs suggests its application in a modern linestage - ergo the EZ linestage. However if we series a pair of UTS and set the jumpers to highest gain we now have a state-of-the-art quiet phono stage, just needing a simple RIAA network in between. So: UTS module> > CD/DVD tube output stage> >EZ linestage> >EZ phono stage. But that's not all! One power transformer can power two UTS modules so if we wanted a balanced output stage - just use two and configure as shown in the instruction manual. The Universal Tube Stage does it all. Also we will soon have our Ultimate Volume Control working together with the EZL. This will be the ultimate in transparency and utility.